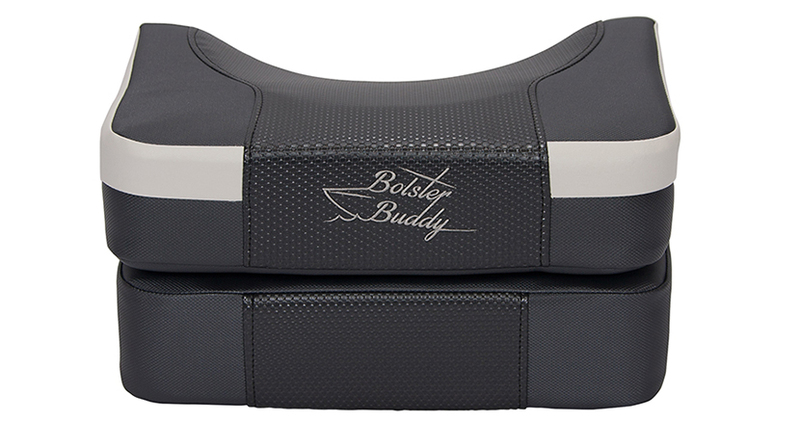 At Bolster Buddy we believe boaters should have a cost effective option for a high quality boat cushion, to get the height and comfort you deserve instead of replacing your seats, standing, or sitting on shifting objects. 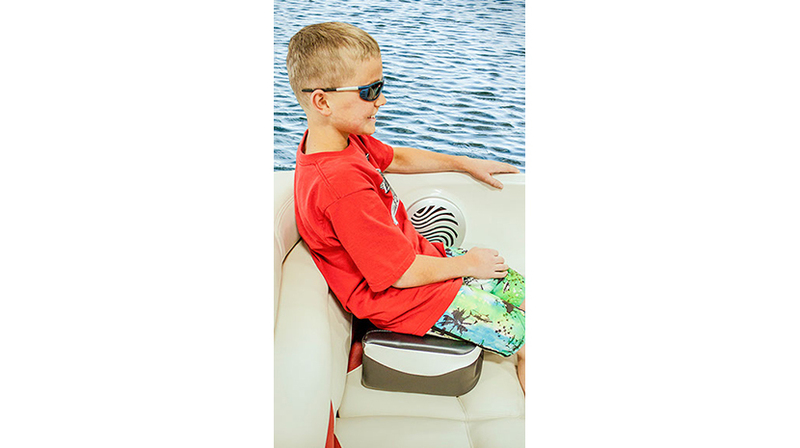 Bolster Buddy is a high-quality cushion designed to help boaters see over the bow of their boats while seated behind the wheel. 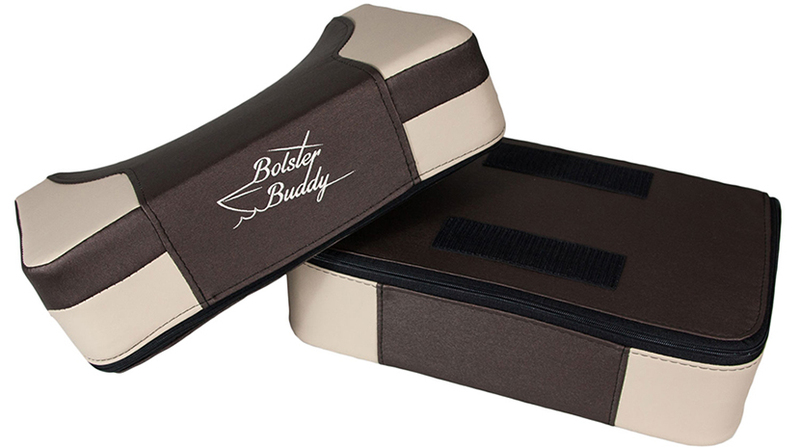 As a cost-effective alternative to expensive flip up bolster seats, Bolster Buddy offers the perfect combination of comfort, versatility, and height. This product was designed for adults, but can be used by kids as well. 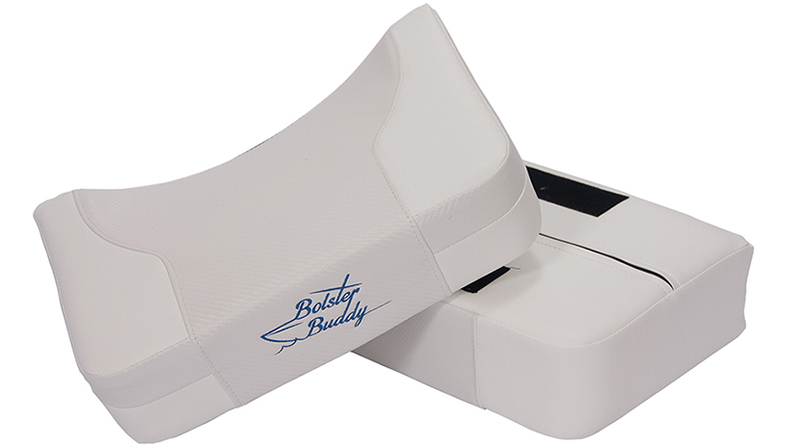 No more straining your knees, Bolster Buddy makes it easier to stand since you won’t be sitting too low. Buy a Bolster Buddy today! I don’t usually write reviews but I have got to tell you how happy I am with my bolster buddy. We recently bought a dual-console and despite being 6’4” I was needing to stand while driving. Well needless to say that got old real quick and I was starting to wonder if we chose the right boat style, or if I was going to have to look into an expensive seat upgrade. Bolster Buddy to the rescue! I ordered the large size, and problem solved! I am now sitting very comfortably with a perfect view over the bow. No more tired legs! In fact, my wife and two kids also love it! It’s easily the best bang-for-buck accessory that we have purchased. Not to mention it is obviously a very high quality item that will last a long time. Just wanted to let you know how much we LOVE the Bolster Buddy! It works perfectly in our MasterCraft and both my husband and myself can now see over the windshield! It was the perfect solution for our aching knees! Thank you!!!!!! Thank you! By the way, we were on our boat about a month ago in La Crosse and my husband always stacks numerous flat flotation devices on the driver’s seat while he’s out on the water. He was just complaining that he needed to take the boat in and have a different seat installed, and we came in off the water, and a little flier was on our windshield for the Bolster Buddy. What timing. I saved the flier and now that it’s time for his birthday I thought this would be a perfect gift. 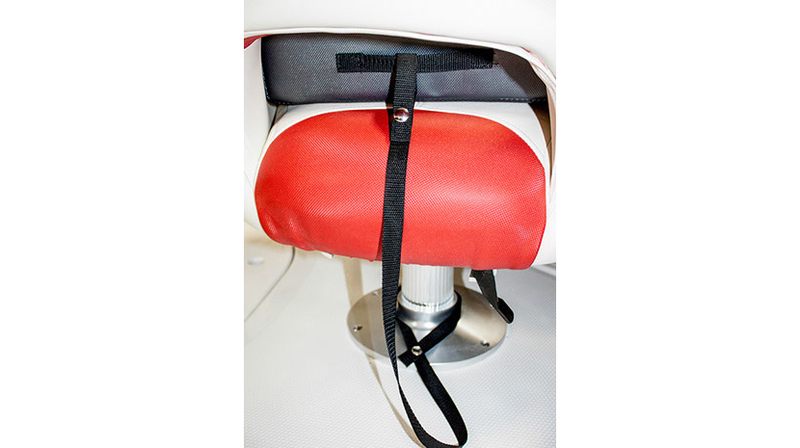 Bolster Buddy takes pride in our American Made quality and want our customers to be completely satisfied. If you are not completely satisfied for any reason, please return the product within 30 days. Unopened and unused products qualify for a full refund. Used products will be inspected and a handling fee of up to 20% may be applied. Shipping is not included. Please contact Bolster Buddy prior to returning the product to receive a Return Material Authorization (RMA) Number. Warning: As with other vinyl products, this product can expose you to chemicals including, Di-iso-nonyl Phthalate, which are known to the State of California to cause cancer. For more information go to www.P65Warnings.ca.gov. Glad I found your product through a Google search! 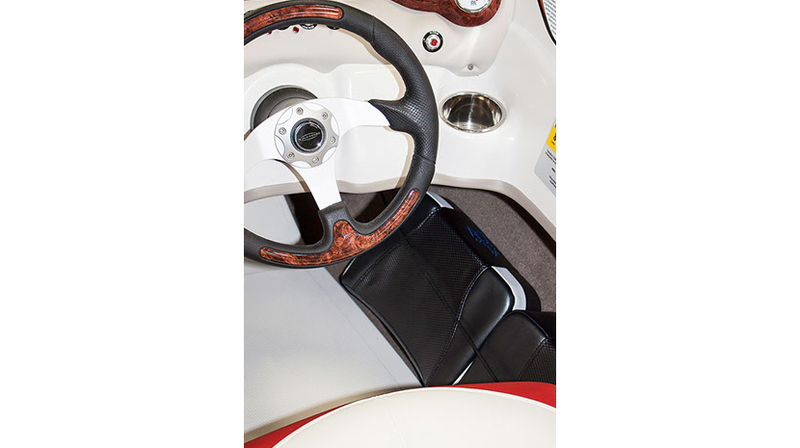 I have a 2013 Cobalt 232 which is a great boat with a flip up bolster seat, but even at 6 ft. 1 inches tall, I find I need a few more inches to see completely over the windshield frame at the level I like! Cobalt has an adjustable height seat pedestal but wants $700 for it, and it would only give me 3 more inches. I have ordered both your small and medium Bolster Buddies tonight and will make good use of both of them. Bolster Buddy is a Christian-owned and operated company. 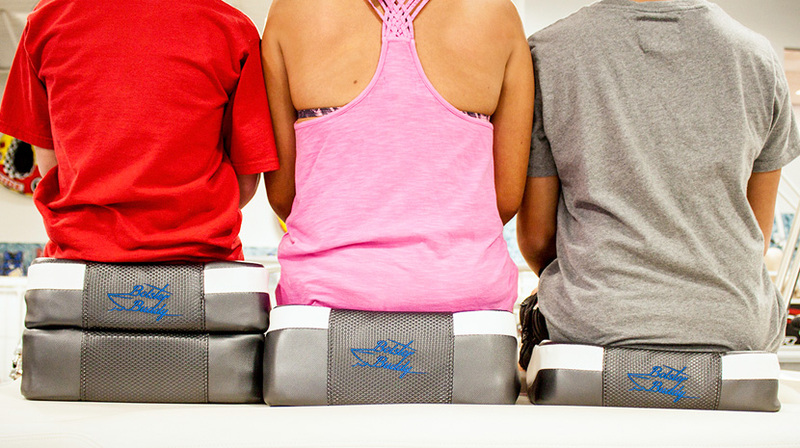 The Bolster Buddy family is proud that its high quality products are 100% American made. 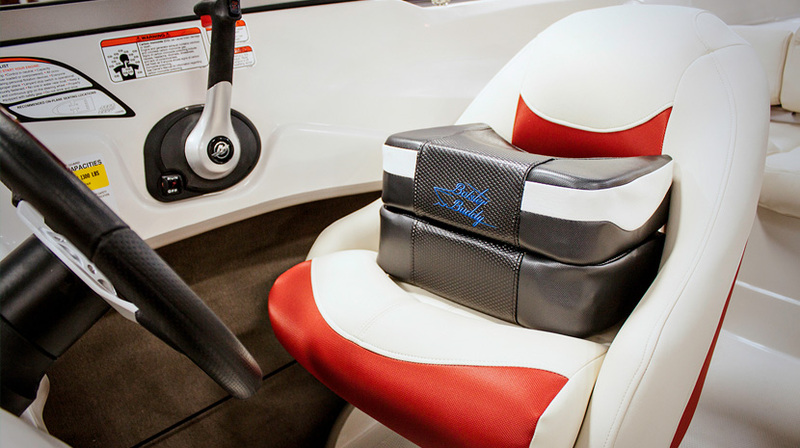 Bolster Buddy is the invention of owner Rick Velasquez, a decorated combat veteran and boating enthusiast. After returning from Afghanistan in 2011, Rick purchased a boat and began spending time with his wife and son on many of Minnesota’s 10,000 lakes. While he loved being on the water, Rick soon tired of sitting on his knee or on bumpers to get added height in his seat. There had to be a way to achieve height and comfort. 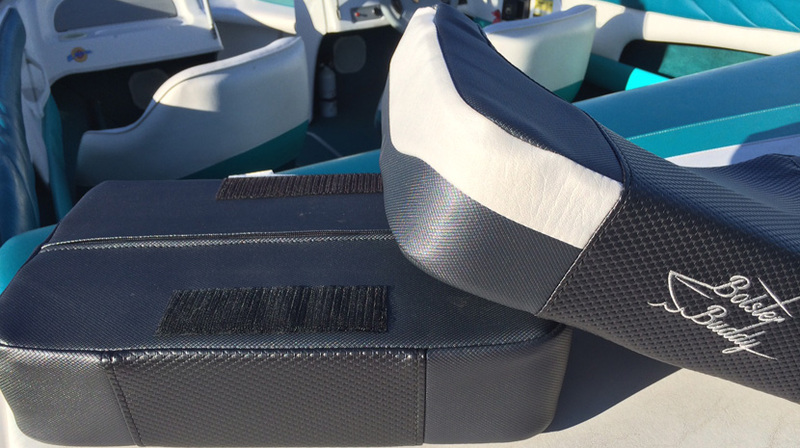 Outfitting his boat with new, matching, flip-up bolster seats could cost upwards of $700. Rick knew he could develop a more cost-effective, multi-functional solution. Shortly thereafter, Bolster Buddy was born. Today, Rick is committed to staying mission focused, quality-centered, and keeping Bolster Buddy American made. Absolutely LOVE this product!!! I've been looking for years for something like this. It worked perfect! Wow. This works amazingly! Thank you. Great product! How deep (front to back of the seat) is the cushion? The depth from front to back is 10” for the small through large and 16” for the x-large. What is the best seller? The large is the biggest seller, followed by the x-large and medium. Is the difference between a small, medium, and large just the height? Yes, a small provides 4” of height, a medium is 6” and a large is 8” of height. Yes, but you will need to pay for shipping. The charges will display when you are checking out. As well, there could be additional customs charges that your country might charge you. Bolster Buddy is not responsible for any additional charges your country might charge you.